Adopting a rural school has turned out to be a great experience for Urukundo Learning Center. To begin the last term of the 2012 school year Urukundo presented chalkboard and chalk, exercise books, paper, pencils, crayons, coloring books and some clothes to the students and families of our adopted school. I am in awe. 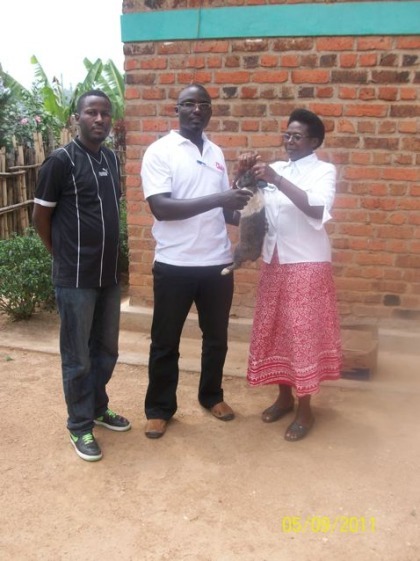 With all their needs they wanted to show their gratitude and presented Urukundo Learning Center with a rabbit. Such a wonderful gift. Legal representative Alain, Jean Marie from Urukundo and Marieta, head teacher at Cyakabiri Nursery School. It is a compliment to Cyakabiri Preschool to be in partnership with a sister school where the help is so needed and we share a purpose worth so much. Our community outreach continues.